Congratulations to WGT player mrenn29 who won the 2011 Virtual U.S. Open Championship played on Congressional Country Club last week. A record-number of WGT players posted over two million rounds of virtual golf on Congressional Country Club. However, only 210 top players qualified for the Championship rounds, and in a close contest, mrenn29 won with an opening round 62 and a come-from-behind closing round of 57 for a two-round score of 119. Close behind, but unable to catch mrenn29 over the weekend, were TugboatDoug at 121, wildcat18racin6 at 122, 5 players tied at 123 including dansamcam, Dianne81, hesomist, Daskino and Starsandros, and 7 players tied at 124 in ninth place including last year's champion BolloxInBruges. The closing round of 57 shot by mrenn29 was the low round of the tournament and featured a "perfect" front 9 with all birdies for a 27. That's mrenn29 lowest nine-holes ever and couldn't have come at a better time! Mrenn29 started playing World Golf Tour in May 2010 and has played over 1,000 ranked rounds in the past year, including many tournaments and multi-player match play and alternate shot games. Mrenn29 is a member of The Deviations country club on WGT that includes many past winners and champions. As the 2011 winner, mrenn29 earns a trip from the USGA for two to the 2012 U.S. Open held at Olympic Country Club in San Francisco, which is also the home of World Golf Tour so the WGT Team will be celebrating with mrenn29 next year in person. 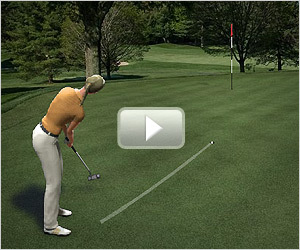 WGT took a look at what virtual equipment was used by the top players in the 2011 Virtual U.S. Open Championship. If you look at the equipment used by ALL 210 qualifiers in the Virtual U.S. Open, most is similar to mrenn29, but with some interesting exceptions, especially with the short game equipment including the wedges, putters and balls, as well as the practice of carrying an extra wedge instead of a hybrid. Visit the WGT Pro Shop to review and compare equipment and read WGT player reviews. This week is the Virtual U.S. Open Championship on WGT featuring 210 top players competing for the championship with two 18-hole rounds ending on Sunday, June 26th. And Dianne81 just posted a 123 (60-63) to take the lead by 2 shots! Follow WGT on Facebook and Twitter for live scoring updates. This is a Guest Blog from top World Golf Tour player BolloxInBruges, who won the 2010 Virtual U.S. Open and a trip for two to the U.S. Open. WGT asked him to share his experience on his recent trip to Congressional. In this year’s Virtual U.S. Open, he was the top qualifier with a 54, and just posted a 59 in the first round of the championship, 1 stroke behind the leader with 18 holes to play. First off, for those that don't know, I'm Sam from Duluth, Minnesota. I joined WGT back in Feb 2009 as BolloxInBruges and have played over 3,000 virtual rounds. I just returned from a long weekend watching the U.S. Open at Congressional. This was my grand prize for winning the Virtual U.S. Open on WGT last year. Getting ready for the trip, it was nice to pack some shorts into the luggage, it has not been above 75 degrees yet this year on the chilly shore of Lake Superior so I hadn't had a chance to experience summer until the trip. I took my dad with me who is a lifelong golfer and even an occasional WGT player. Was a great way to spend Fathers Day weekend. It was a very fun trip for him also as he had not even been on a commercial jet in a few decades. Onto the highlights from the golf action, Rory’s shot on 10 on Sun that nearly went in has to rank at the top. From my vantage point behind the green it looked as if it were hanging on the lip. The crowed reaction was awesome as it became louder and louder as it trickled back down to the cup. We also had a great view of Charl Schwartzel's 105 foot putt from the fringe on 3 on Sat, and Ryan Palmer’s 70 foot double breaking putt from the back fringe on 17 on Fri, just to mention a few. It was also cool taking in the scene at the final hole as Rory finished up. It’s a pretty awesome finishing hole for the spectators, all of the tens of thousands of us that stuck around had at least a decent view of the action on the 18th green. Not like most tournaments where you have to stake out a spot all Sunday afternoon on the 18th just to see the winner finish. Just experiencing Congressional in person was almost as fun as seeing all the Pros. As good of a job as WGT did on the course you really can't appreciate the elevation changes without being there. There were lots of spots where I thought "ahh, so that's why the ball does that on WGT in that place". It was especially fun when the pin positions were in similar places to the WGT locations. The caddies or even the Pros should really be playing the course on WGT for a month before the tournament just to learn the subtle breaks of the greens. Aside from the golf action trip went smooth except for a rush to make our connecting flight in Minneapolis only having around a 15 minute layover due to our first flight being delayed out of Duluth. Definitely got to see plenty of Bethesda on the 30-40 minute shuttle commute each way to and from the Montgomery Co. Fairgrounds and Congressional, real nice neighborhood. The hotel was also quite nice aside from the lack of a hot tub, sure would of felt nice after walking all those miles around the course! One extra day would of been nice to do a little more sightseeing with so many touristy things to see in DC. We did get a nice view of the Lincoln Monument, and the Washington Memorial on the way to Bethesda. Then spent the day on Monday at Mount Vernon, and got to take a tour of the inside of George Washington's house and all the other buildings on the property. It's 8,000 acre estate on the banks of the Potomac River where George spent most of his life, and still contains many of the items that he used every day. As far as this year’s Virtual U.S. Open, I'm very excited to tee it up this week at Congressional. Have to admit being a little discouraged seeing FunkieJunie3000's awesome 58 as I checked up on WGT from the DC airport. Just hoping for something around 60 or 61 in the opening round to stay in touch with the leaders. There are many more players this year capable of winning the big ones, so it is really going to take some solid play to contend again in the Virtual Majors this summer. With over 1 million rounds posted in the Virtual U.S. Open Qualifier, 210 WGT players have qualified for the Virtual U.S. Open Championship. The qualifying cutline was 59 and the best score posted was a 54 by BolloxInBruges, last year's champion who's just returning from his grand prize trip to Congressional in DC. 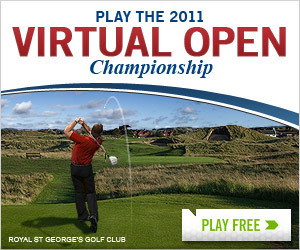 The Virtual U.S. Open Championship rounds starts today for the 210 qualifiers to decide the ultimate champion and winner of the grand prize trip to Olympic in San Francisco, site of the 2012 U.S. Open. The first round must be played by end of day Wed 6/22 PST and the second round must be played by end of day Sun 6/26. The lowest combined score wins the grand prize. Unlike the Qualifier, these are single-rounds not unlimited-play, so every shot counts. SCORING UPDATE...with over 50 scores already posted today, Funkyjunkie3000 is leading with a 58, cyl6 with a 61, Hanswurst72 with a 62, and 5 players are tied at 64...but there's lots of golf left to play. Watch the leaderboard here. WGT will be following the Virtual U.S. Open Championship and reporting updates on the WGT Blog, Facebook, Twitter and YouTube accounts, so stay tuned! 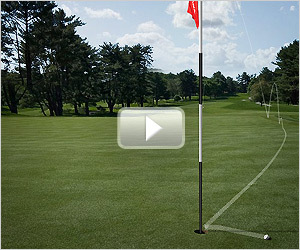 Check-out more great shots in our second Virtual U.S. Open Highlights video on YouTube. This week’s video features the longest drive, longest putt and longest hole-out of the week at Congressional. Save your replays to be included in future highlight videos and subscribe to our WGT Channel on YouTube to get updated when new videos are posted. Virtual U.S. Open Highlights - Highlights of some of the great shots from this year’s Virtual U.S. Open being played on WGT. Golf Boys - One of the hottest videos on YouTube with over 1 million views. Watch golf’s first boy band “Golf Boys” featuring golf pros Ben Crane, Rickie Fowler, Hunter Mahan and Bubba Watson. Hysterical and your view helps out charities. Watch both videos on YouTube and subscribe to WGTers for more golf highlights and tutorials from WGT. We hope you’re enjoying all the U.S. Open action, live-streamed at www.usopen.com and there’s still time to enter the Virtual U.S. Open on WGT. Apparently, Congressional is just as challenging in real-life as it is virtually. Royal St George's now has all 18 holes available for full stroke play! The Qualifying Round for the Open Championship on Royal St George's, site of the 2011 Open, is available through July 17th. Compete for prizes and qualify for the Championship for a chance to win a dream trip to next year's Open Championship at Royal Lytham & St Anne's. The Back 9 Challenge on Royal St George's is also available with additional prizes. 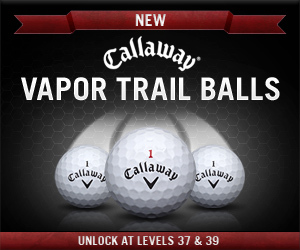 We've added the popular Vapor Trail option to the Callaway Tour balls to help trace your shots through the air, including the Callaway Vapor Balls (L37+) and Callaway Legend Vapor Balls (L53+). 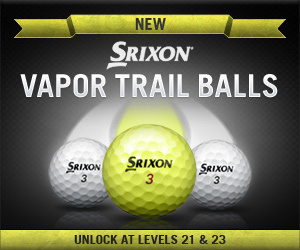 We've also added Vapor Trails and the exciting Neon Yellow option to the Srixon Z-Star balls, including the Srixon Neon Yellow (L11+) and Srixon Vapor Balls Z-STAR (L21+). One of the top player requests has been to improve the performance and consistency of the fringe around the greens, which we’ve just done, so the fringe on all courses now plays more accurately. 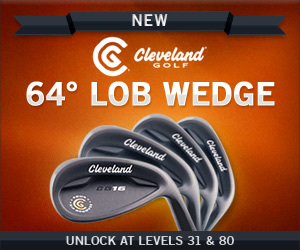 This means you can more easily chip and putt from the fringe, and your approach shots will more easily roll through the fringe as well. It may take a little adjustment but it should be a more realistic experience. Please let us know what you think. At the end of a good scoring round, you’ll now see your score compared to your other WGT Friends on that course. You’ll also have the option to post and highlight that score in your friends' Activity Feed, and for doing that you’ll earn 10 XP (Experience Points). We’re planning to expand Best Scores more in the future, to help you compete against yourself and your friends more easily, so please provide your feedback on what you would like to do with your top scores on WGT.